Henrico honors and celebrates the rich history and diversity of our community throughout the year in many ways, through special programs, educational events, food festivals, and music. February is Black History Month and this significant commemoration is important in Henrico. Our libraries are a wonderful resource as we look back and honor our past and come together as a community in the present. Henrico honors this history and shares some of these stories with the community through multiple programs at our libraries. As part of their mission, Henrico County Public Libraries has “…connected people with the information they need…enriching community life” through their vibrant library programs, classes and events – and they do this throughout the County in honor of Black History Month. Through partnerships with local organizations such as the Virginia Museum of Fine Arts and the Association for the Study of African American Life and History, they offer programs for Black History Month, and year-round, that connect the community with history and with each other. There are many things that are commonly known about black history. There is the Civil Rights Movement. There are conductors. There’s the Underground Railroad, and then there is mail. At Twin Hickory Library, you can learn how a Richmond slave mailed himself to freedom, and eventually assisted abolitionists by performing across the globe. 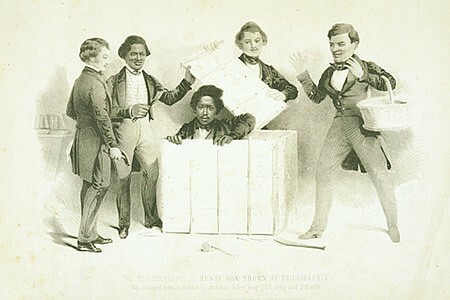 The program, called “Henry Box Brown: Famous Fugitive, Trans-Atlantic Performer,” is organized by the Virginia Museum of Fine Arts and is supported in part by the Paul Mellon Endowment and the Jean Stafford Camp Memorial Fund. Jeffrey Ruggles, a local historian and author, is the presenter for this event, which will take place on February 12 at 6:30pm in Twin Hickory Area Library’s meeting room. The event is open to the public and there is no charge! Theodora Drozdowski, Adult Services Supervisor at Twin Hickory Library, said it best regarding Black History Month, “You become a more empathetic person by listening to other people’s stories, because history is made up of people and their stories.” On Twin Hickory’s events: “You get an opportunity to hear people in your community who are passionate about their subjects, and when you witness those passions, it comes alive for you as well.” Displaying empathy and actively engaging with the community is part of The Henrico Way, and what better way to learn about our history than through hearing stories from our citizens. Fairfield Library will host writing workshops in February for both adults and teens. The adult workshop, called “Recomposing the Greatest Works of Black History: A Writing Workshop,” will be held on Thursdays, February 7, 14, and 21 at 7:00 p.m. and be facilitated by Paula Gillison, of PGArtistry RVA. “We want to create this sense of community for people and offer programs that are inclusive and reflective of personal interests,” said Amanda Sullivan, Teen Librarian at Fairfield Library. “We want to be a resource for people to better their lives.” In commemoration of Black History month, this writing workshop event will consist of reading and examining famous poems, then creating your own version in the same style. Registration is required in order to attend this workshop, so sign up now. In tandem with this workshop, teens can participate in a two-part program lead by poetry slam competition winner Roscoe Burnems, founder of the Writer’s Den RVA. This event will take place on February 7 and 21 from 6:00 p.m. – 8:00 p.m. In this workshop, teens will learn how to create poems and will be given the chance to showcase them in front of an audience. Registration is not required to attend this workshop. To get involved with these and other great events, click here to see what else is going on at HCPL and events sponsored by Recreation and Parks. Power Up your Health (and your wallet)!